Claudia Carson has been at the DCPA for 16 years in a variety of roles: Stage Manager at the Galleria Theater, Production Manager for Girls Only, and Executive Assistant to President Randy Weeks. Claudia took over the reins of the Bobby G program in 2014. She has Directed, Choreographed and Stage Managed the Bobby G Ceremony since the program started. In 2016, Claudia began coordinating the High School One Act Playwriting Workshops and Competition. She loves working with Colorado’s High School educators and students on both of these programs and is in awe of the talent she sees daily in her work. 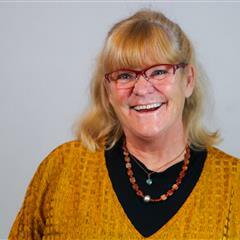 Claudia was the K-9 Theatre teacher at Graland County Day School and directed and choreographed the 4th and 9th grade musicals as well as performances in all grades throughout the year. She has choreographed and acted at the Arvada Center, The Aurora Fox, and The DCPA. She has been a teaching artist at The Arvada Center, The Mizel Center and the Aurora Fox Summer Theatre. Claudia is excited to get back to her roots as an educator/teaching artist and is honored to be part of the amazing team here in the Education department.